My first ever pumpkin pie! You must know this by now about me as I have said it so many times: I LOVE autumn and everything that is associated with it! When I still lived in Romania I loved the leaves changing colour and falling and the crunchy noise they made when walked upon. I loved my mum’s winter can and preserve-making and a good baked potato with plenty of butter. Since I moved to Northern Ireland I came to love everything that has to do with pumpkin: pumpkin soup, pumpkin carving and now, this year, for the first time, pumpkin pie baking! I researched a lot for the perfect pumpkin recipe last week. I pinterested, I Googled, I checked other mummy blogs for tips and advice. In the end, I decided to sum the knowledge I acquired into my own(sort of) recipe, taking bits and bobs of advice from here and there. But I will acknowledge the contributions: Mummy Alarm gave me the idea of decorating the top of my pie and reinforced the need to prebake my pastry before adding the pumpkin mix. MumWhatsForDinner gave me the idea to replace sugar with condensed milk and sent me looking for a good pumpkin pie spice mix. 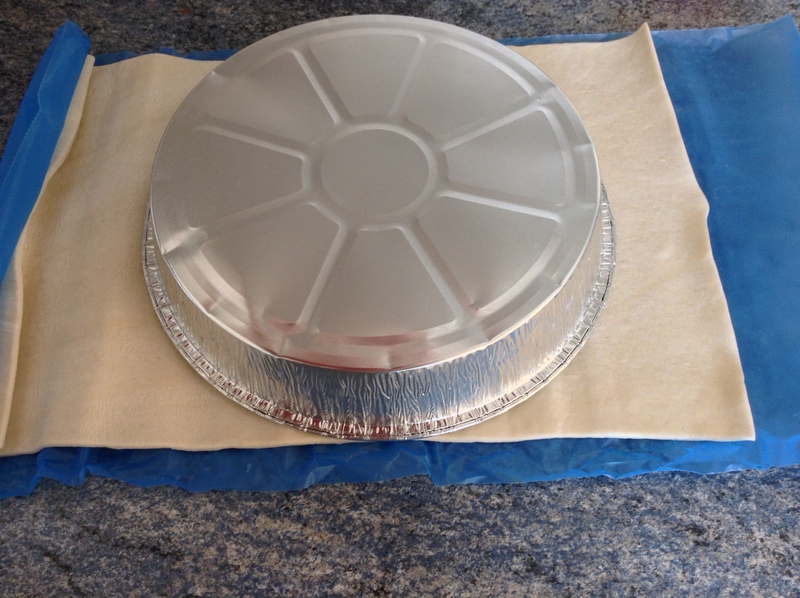 And finally, CanadianLiving made me feel less of a qualified baker by their use of ready made pie pastry! 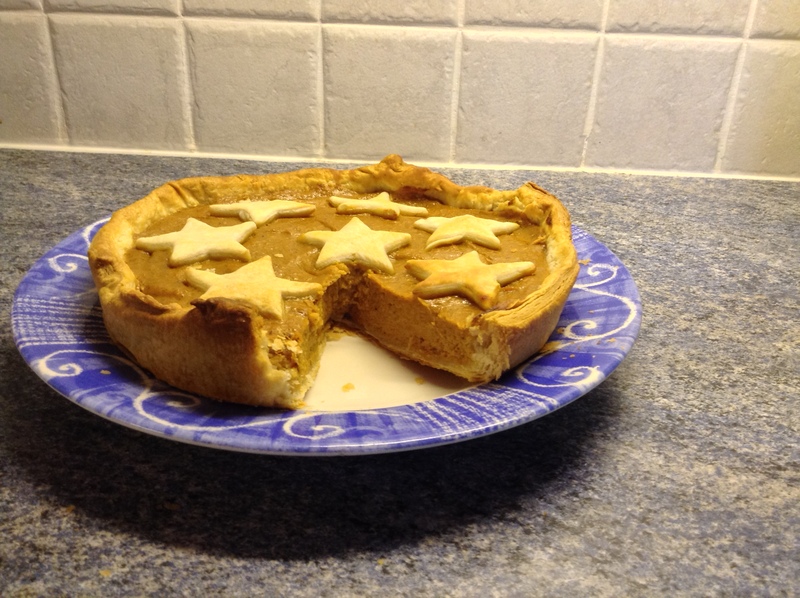 Because I am pregnant and because I am not a very confident baker I used ready-made pumpkin puree and pastry. It came out really nice (I had my Canadian-born friend test it for me and got the mmmmm…of approval) so I don’t think I will bother making my own puree and pastry next time either! 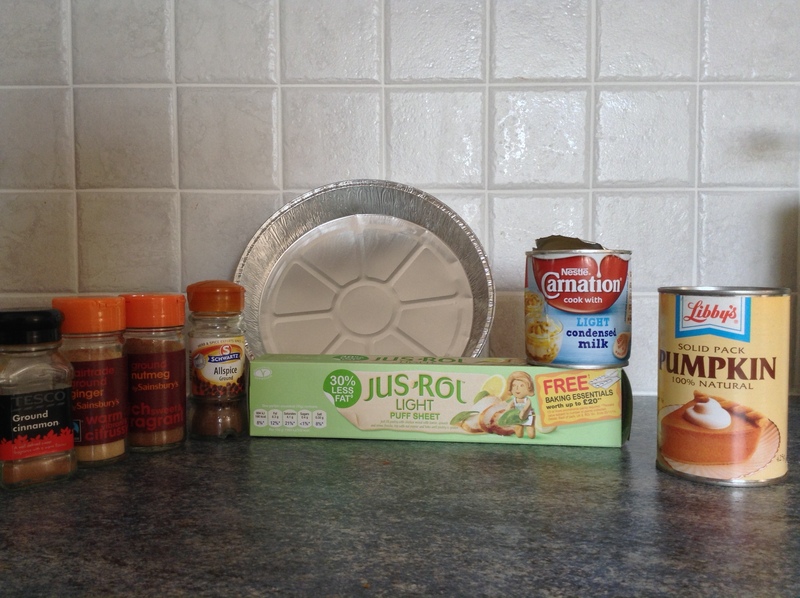 This is all you need to make this pie. Oh, and an egg, I forgot to include it in this picture! I should have left some more pastry hanging over the edges as it slightly shrinks in the oven but I will know better next time. I added baking beans (well, I didn’t actually have baking beans so I used soup mix pulses as a substitute) over parchment paper and baked my pastry at 180 degrees for about 30 minutes. 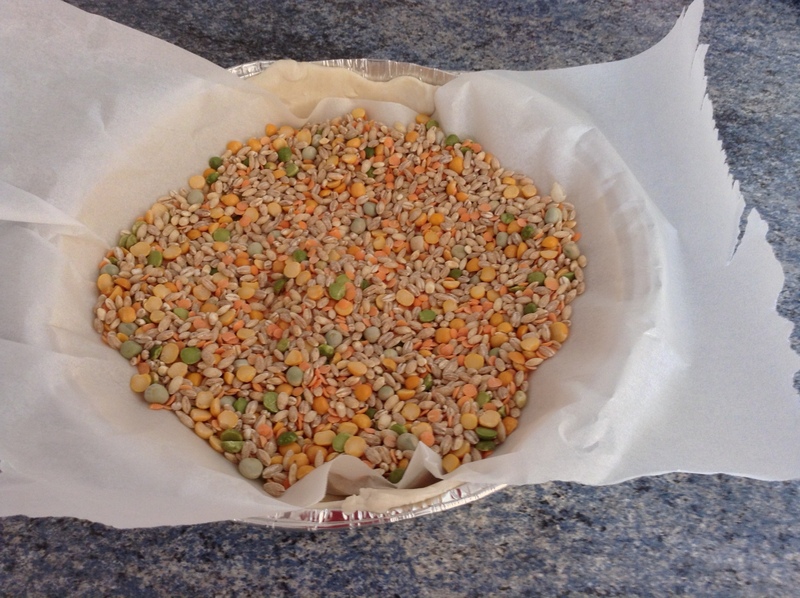 Any dry pulses work well as baking weights. 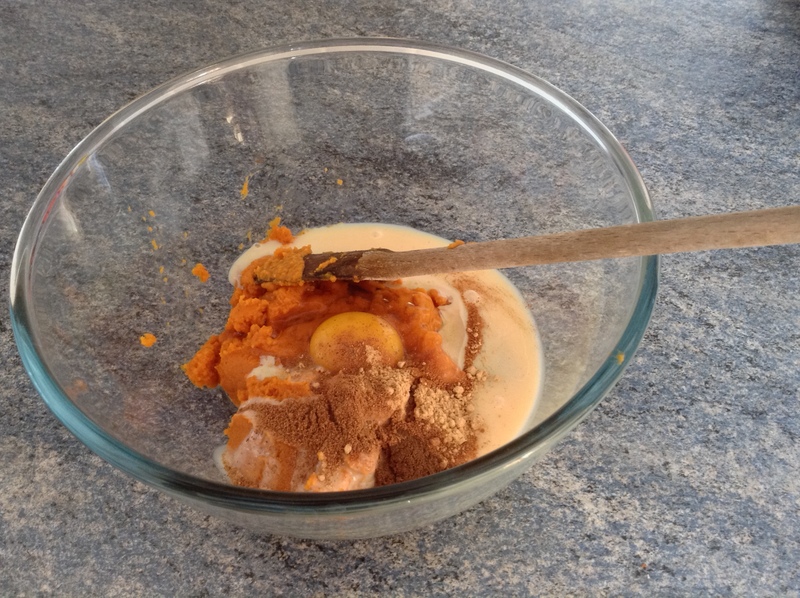 Meanwhile, I prepared my pie mix: 400 grams of pumpkin puree, one egg, half a tin of condensed milk and one teaspoon each of ground cinnamon, ground nutmeg, ground ginger and ground allspice. It came out lovely and flavoursome but if you prefer your deserts mild then leave out the allspice. 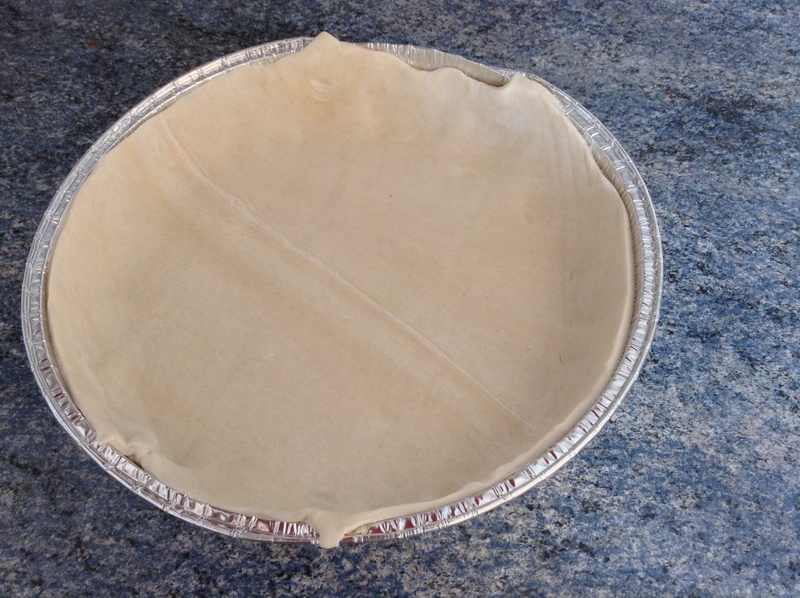 Once your pastry case is baked and slightly cool, add the pie mixture on top, smooth it over and add it in the oven for another 30 minutes. 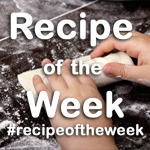 If you are lucky enough to have budding little bakers in the house, ask them to help cut out some pastry decorations to go on top of your pie. 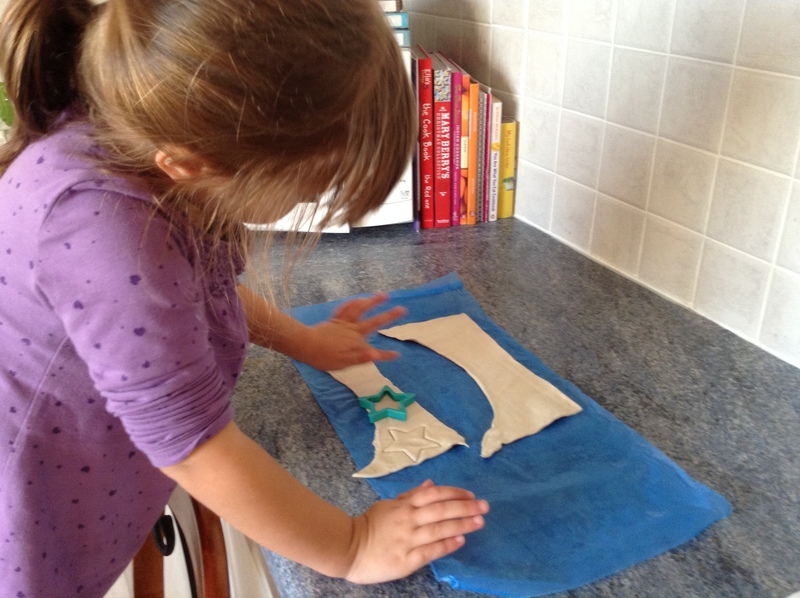 My pretty little baker helping me cut out pastry stars. We would have loved some maple leaves but had no appropriate cookie/playdough cutters so stars worked a treat too! Enjoy with a dollop of cream or a good helping of vanilla ice cream! I had none so I had mine plain. Not bad for a first time, not bad! Hope I have demonstrated that pie baking isn’t all that difficult. I truly enjoyed making it and I am now looking for other simple and flavoursome recipes to use the rest of my pumpkin puree! 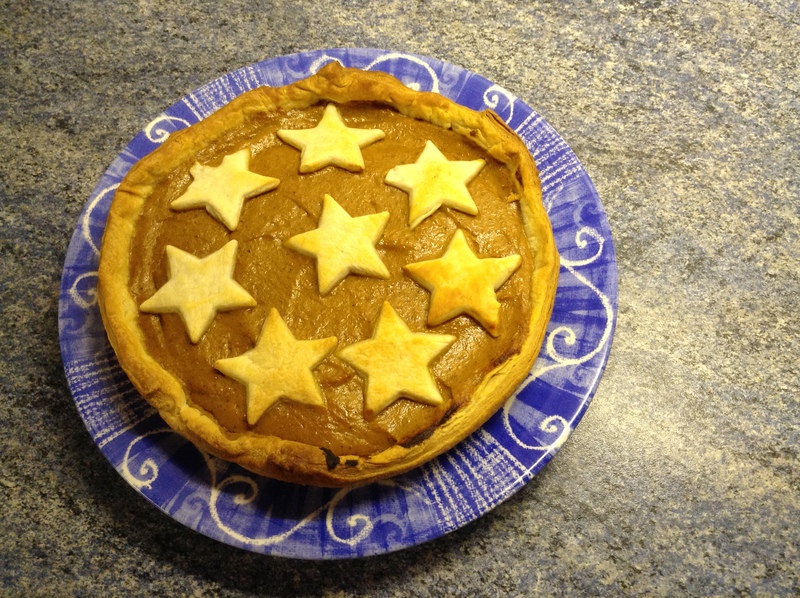 Well done you for creating such a good looking pie! And it sounds yummy too! Thanks, Iva, yours looked lovely too! Yes, it is another gorgeous day, aren’t we blessed this year? I will come back, thanks for stopping by! It was, polished in one sitting :-)! Thank you, Alison, we had fun making and eating it :-)! Yes, Emily, hope I can write my post tonight. Thanks for pinning and stopping by!